During these past fourteen years, he has also flown in Europe, Canada, Mexico and throughout the USA. He enjoys the meeting of new people and seeing the joy in their eyes when they see the balloons inflate and fly away. 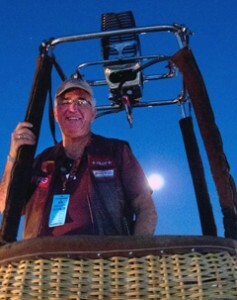 John really enjoys sharing the sport of Hot Air Ballooning. He is currently flying his third balloon in the area. Along with his friends in the Fox Valley Balloon Group, they enjoy painting the skies over the valley with colors and shapes, as well as warming up the crowds in the years past at our Appleton Christmas parade with the sights and sounds of ten balloon burners lighting up the evening. John is a retired Chief Petty Officer -United State Navy, as well as he also retired from Fox Valley Technical College, where he taught in the IT department. He has been a member of our valley community for more than twenty nine years. Join pilot John Ross and his flight crew as they explore all the sights of the Fox River Valley from the comfort of a hot air balloon gondola basket. A typical balloon flight lasts for approximately one hour, as you ascend to heights to see Lake Michigan, Green Bay, and Lake Winnebago, and then descend to waft over the rural countryside and witness the sights and wildlife that exists all around our beautiful Wisconsin area. He really likes the intimacy of two or three passengers in his basket. You are not having to share this unique experience with a dozen people during your flight. Flights are normally booked for a specific day, and you can plan on flying about two hours before sunset. Some morning flights can also be scheduled on weekends. Approximately 48 hours before your scheduled flight, you will be contacted to inform you as to where and when to meet for your “once-in-a-lifetime” experience.